During the first Comstock boom of the 1860s, Dayton, Nevada, on the Carson River at the foot of Gold Canyon was a favored location for milling operations for the ore from the mines around Virginia City. In 1869, mill owner Frederick Birdsall built a short horse-drawn railroad to haul tailings from Gold Canyon to his Lyon Mill in Dayton. When the narrow gauge Carson & Colorado Railroad reached Dayton from Mound House in late 1880, Birdsall built a new connecting railroad of the same 3 foot track gauge, completing it in June 1881. Replacing the horses were two small steam locomotives, the first of which arrived in Dayton on July 11. In early 1882 Birdsall became interested in a new railroad development in California, and in April sold his mill and railroad to J. M. Douglass. Birdsall's two original engines were not included in the sale, so the new company, under the name of the Dayton, Sutro & Carson Valley Railroad, ordered the JOE. DOUGLASS. from the well-known builder of small locomotives, H. K. Porter & Co. of Pittsburgh, Pa. The 0-4-2T type engine, with four drive wheels and two small wheels behind supporting an attached water tank and wood bunker, was completed on June 12, 1882, and raised its first steam in Dayton on September 14. With that the railroad was back in business with steam power. Douglass quickly extended his railroad empire. By November the rails were approaching the town of Sutro, and by February 1883 the line was in regular operation beyond there to the tailings reservoirs of the old Carson Valley Mill site. The JOE. DOUGLASS. remained the only locomotive on the Dayton, Sutro & Carson Valley RR throughout the life of the operation, shuffling back and forth with cars of ore for the several mills along the line. Needed maintenance on the locomotive was performed by the nearby shop crews of the Virginia & Truckee Railroad. Generally repairs could be handled by V&T shop workers sent to Dayton, but on occasion the little engine was most likely sent to the massive stone shops of the V&T in Carson City for heavier work, riding from Mound House to Carson City on the 3 foot gauge rails permanently attached to the deck of special V&T engine transfer flat car No. 1. This pattern of operation continued into the late 1890s. Research has not yet turned up the last day of operation of the Dayton, Sutro & Carson Valley RR, but most of the mills were closed before 1900. The new century brought a new job for the JOE. DOUGLASS. Sold in 1900 to the Lake Arrowhead Development Co., the little locomotive was shipped from its Nevada home to the Lake Arrowhead Dam site in the San Bernardino Mountains of San Bernardino County, California. After the dam was completed in 1904 the engine was left abandoned on a short stretch of track at the site. Several generations of children played on it during summer vacations at the reservoir. Somehow it survived the scrap drives of two world wars. Searching for a small locomotive to display at his La Pat Guest Ranch in Palm Springs, Jim Fouch acquired the Joe. Douglass in 1946 or '47. There followed a succession of owners but, except for painting, little was done to fix up the engine until Bob Walton of San Marino purchased it in August 1968. Aided by knowledgeable Southern California railroad enthusiasts, the long process of rebuilding the locomotive to operable condition was begun. The boiler was successfully hydro tested in 1970, and most of the machinery was rebuilt. New castings were made and other parts fabricated following original Porter designs, replacing parts that had disappeared over the years. An 1882 photograph of the Joe. 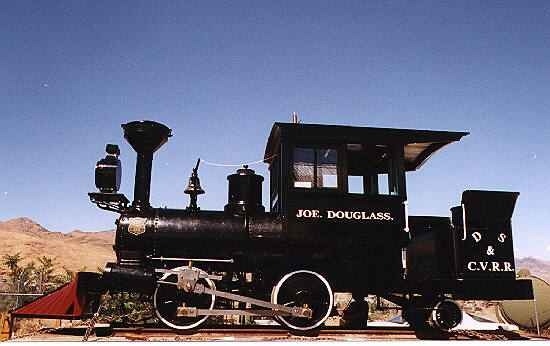 Douglass operating in Nevada provided a guide in building a new wood cab and for the appearance of other details. Walton test-steamed the engine, and operated it on compressed air a number of times, but the engine has not received a final boiler inspection and certificate needed for regular steam operation. Walton moved to Los Altos on the San Francisco Peninsula in the mid-1970s, and kept the JOE. DOUGLASS. in his back yard. Concerned about the ultimate disposition of the little engine, he felt it was fitting and appropriate that it return to Nevada, its working home for so many years. Turning down higher offers Walton agreed to a sale to the Nevada State Railroad Museum in September 1994. The acquisition was made possible by the generous support of Meadowood Mall in Reno, who provided a grant to the Railroad Museum covering the costs of acquisition and transportation back to Nevada. On November 17, after receiving a new paint job and other minor repairs, the JOE. DOUGLASS. was placed on display-in the center of the mall for the Christmas season, the centerpiece of an exhibit promoting the Railroad Museum. The JOE. DOUGLASS. is a rare artifact from the silver age of Nevada's mining and railroad history. The engine is typical of the many small industrial locomotives used in mining operations around the state and throughout the country. There are very few locomotives of this age and type still in existence anywhere, and nothing else like it at the Nevada State Railroad Museum. The acquisition of the sole locomotive from this local railroad in nearby Dayton represents a valuable and significant addition to the Railroad Museum's historical collections of Nevada and 19th century railroading. As has been typical in so much of the past development of the Nevada State Railroad Museum, private support was the key to bringing this historic engine back to Nevada. The public spirit and generosity of Meadowood Mall has enabled future generations to enjoy the JOE. DOUGLASS. at the Railroad Museum.